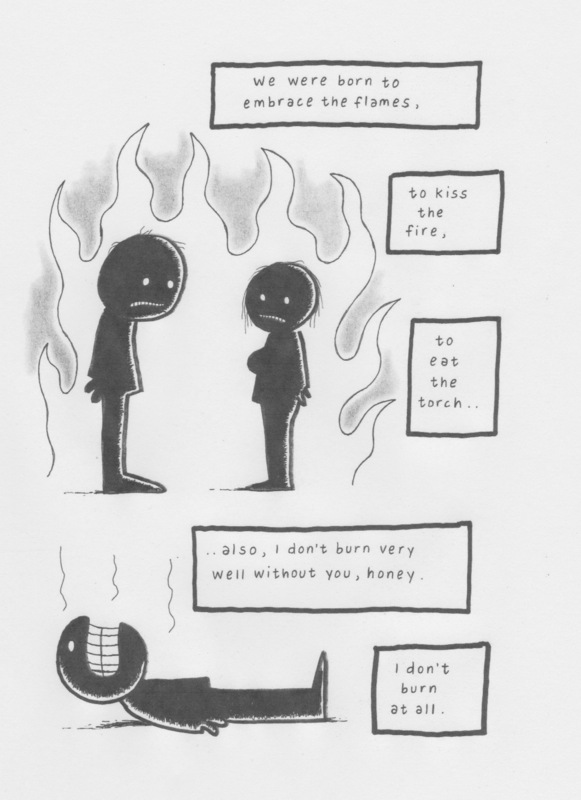 BOLD MONKEY: Graphic Book Review/ Interview: Janne Karlsson Embracing the Flames. 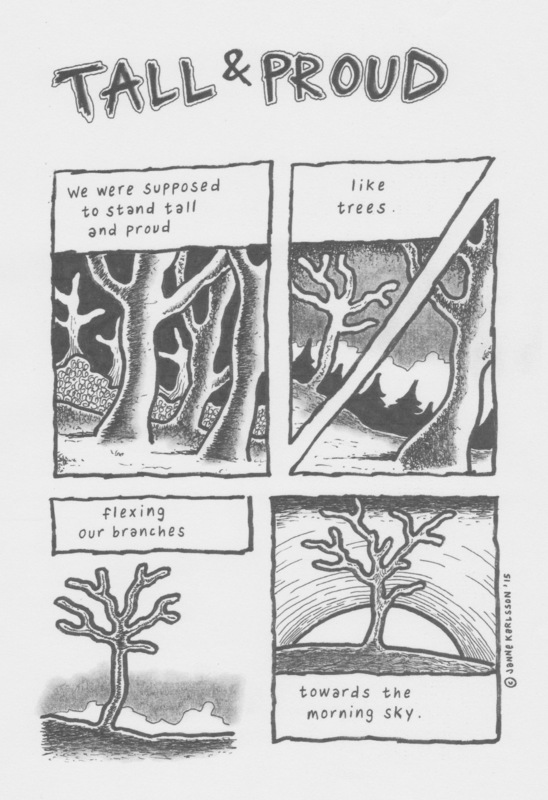 Leaf Garden Press, 2015 (69 pages). Graphic Book Review/ Interview: Janne Karlsson Embracing the Flames. Leaf Garden Press, 2015 (69 pages). 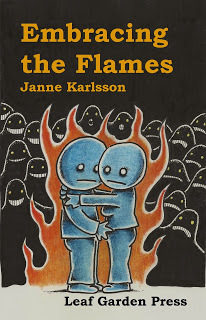 Embracing the Flames is the Swedish illustrator, Janne Karlsson’s latest book. It consists of 63 self-contained sketches which characteristically castrate mainstream cultural norms. Karlsson’s bleak landscapes are littered with dead trees, piles of human skulls, nooses and bottles of booze. There are “sick bastards” going nowhere & losers searching for unanswerable questions. Like us, they live in a world where religion is phoney & hateful and death is always only a heartbeat or two away. 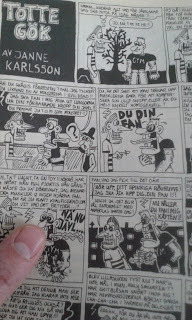 This manic fury to get it down & then to move on means Karlsson’s work is continuous. He simply creates without too much intellectualising about it. Consequently, his art is usually piece-meal rather than a longer sustained activity. Although these pieces are largely independent of each other, Karlsson explores many common themes throughout: the failure of relationships, solitude, depression, pain & the possibility of redemption. Karlsson’s work is edgy & extremely varied in subject matter. Sometimes his art expresses a gritty sense of triumphantalism, yet in the next panel or two, you might feel a deflated, gob-smacked melancholia.You might laugh yourself stupidly over several pages & then you might get an uncertain, creeping sense that the composer’s walls are only loosely flailed together by some dodgy sticky tape. 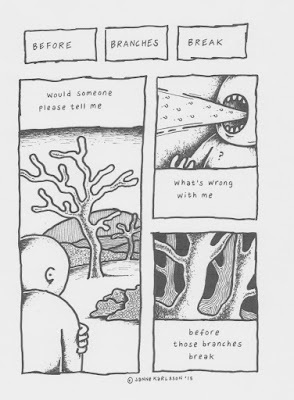 This is a mature, independent series of surreal drawings by Karlsson. He presents a fascinating world of characters who are essentially in search of love & meaning. Yet the people he portrays are largely seen as trapped by personal deficiencies and larger inexplicable cultural & political forces. Karlsson transcends these boundaries thru his skill at consistently illustrating how badly people are fucked up. Janne, when did you first realise you had a knack for drawing? What sort of sketches did you accomplish then? I have to ask this but did you have a happy childhood? When did you start publishing your work and what were some of the places where it first appeared? How did you arrive at your current style of illustration? Do you have a set routine when you go about drawing & writing? Do you create everyday? Do you work quickly without much revision? 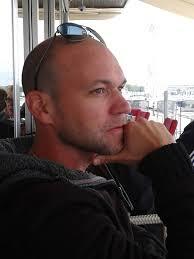 Your work has appeared in over 300 magazines worldwide and you have published several books to date. What have been some of your major achievements to date? No one is really listening to us right now, but tell me mate, are you really like many of the mad fuckers that you create on your pages? Turning to one of your latest books, Embracing the Flames why did you decide to publish it through Leaf Garden Press, rather than say, your own publishing company? Is there much ink left up there? What current projects are you working on now? Have you ever seriously contemplated longer projects, such as a graphic novel? Thanks again Janne for your time!